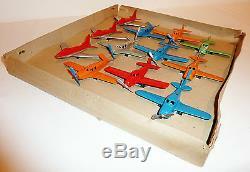 This circa 1950 TOOTSIETOY 1-DOZEN AIRPLANE ASSORTMENT SET #1200 is in Near Mint original condition, in a partial original box. The 3.5-inch long diecast airplanes have just a few tiny paint abrasions, but no signs of actual play wear. The complete set comes with: 3 Beechcraft Bonanzas, 3 Navions, 3 F86 Sabre Jets, and 3 Piper Cubs. All have virtually fresh black rubber tires. The original box bottom is complete, but has 2 torn corners. The original inner spacer is in place. The box lid is missing. 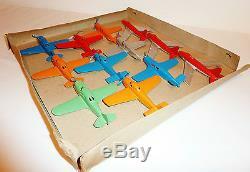 This is a great looking assortment set of planes. You will be happy when you land them into either your Tootsietoy, die-cast or airplane toy collection. Shop with confidence, we give a 30-day return privilege. Tab, under my pictures, you will see that I have listed. Please let me know, and I will add it to your invoice. For lots of other toys available. 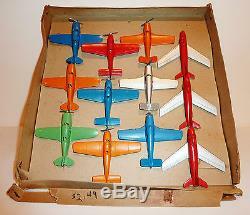 The item "12 TOOTSIETOY c. 1950 AIRPLANE ASSORTMENT SET #1200 with PARTIAL BOX 3.5-inch" is in sale since Tuesday, September 3, 2013. This item is in the category "Toys & Hobbies\Diecast & Toy Vehicles\Aircraft & Spacecraft\Vintage Manufacture". 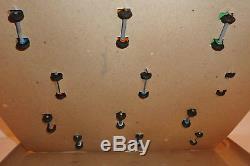 The seller is "surfn4toys" and is located in Santa Barbara, California. This item can be shipped worldwide.